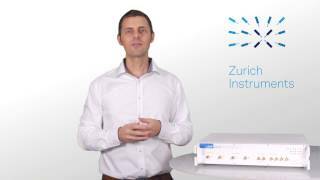 Zurich Instruments arbitrary waveform generators (AWGs) set new standards for usability, channel density, and integration with other measurement tools. Working with our instruments makes your life easier, as they are designed to provide you with the fastest path to realizing your complex signal generation ideas. 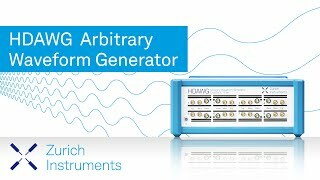 With the highest channel density and the most advanced synchronization features on the market, the HDAWG Arbitrary Waveform Generator is the first choice for multi-channel applications of up to 64 channels. The superior noise characteristics of the 2.4 GSa/s, 16 bit signal generation and an ultra-low trigger latency allow you to push your measurement setup to new levels of performance. The LabOne control software provides an intuitive and efficient way of programming arbitrary signals. The 2-channel UHFAWG Arbitrary Waveform Generator with 1.8 GSa/s, 14 bit D/A conversion is the only AWG with integrated detection that can be configured to your needs with a selection of measurement tools (Scope, Digitizer, Spectrum Analyzer, Lock-in amplifier/demodulation, Boxcar averager, etc.) on its 600 MHz signal inputs. This means that notoriously complex setups with non-sinusoidal excitation patterns can be radically simplified both at the hardware and software level. It also virtually eliminates clock synchronization issues that come with compound setups.